Callie has a morning ritual. After her walk, she gets breakfast. That's some rice that we've cooked with broth and little scraps of leftover meat, usually chicken. With that she gets a dog biscuit. Under the bed with the Tricky Treat Ball. After that, she gets one crunchy treat followed by one chewy treat. Then it's time for the Tricky Treat Ball. I put a small handful of puppy kibble in the ball, then she pushes and tosses it around the house to get the little treats out and gobbles them up. It's a great activity for her both mentally and physically, and since she's moving around she dries out a bit from her morning bath. Sometimes the ball will go under a chair or bed. She can't get under the chair, so she barks for help. But she can and does get under the bed to retrieve her ball. On this morning, I caught her relaxing near the ball, seemingly enjoying the sun for the few moments that it shone directly under the bed. A few seconds later, she was off to take her morning nap. 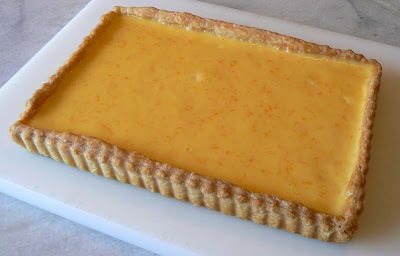 This orange tart is made from exactly the same recipe that I used to make the previous lemon tart. The guy who made it on tv said that if you didn't have lemons, you could use oranges. So Ken bought a couple of oranges and I gave it a try. The only thing to be careful about is that the amount of juice in the lemon recipe is supposed to be 150 ml. The juice of the two oranges I used (plus the juice of half a lemon) came to about 200 ml. For the custard to work properly, you need one egg for each 50 ml of juice. So, for 150 ml, three eggs is good. For 200 ml, you need four eggs. I also added the zest of half a lemon to the zest of the two oranges. I think the lemon helps bring out the flavor of the orange. Don't ask me why. This experience gave me an idea. I'm going to try the same recipe with limes. Kind of like a key lime pie. Doesn't that sound good? This will be my first experience with cold frames. Leclerc had these on sale for a decent price so we decided to try them. There are Leclerc stores all around us, but they're all between thirty and forty-five minutes away, so we just don't go on a lark. Successfully assembled cold frames for the garden. 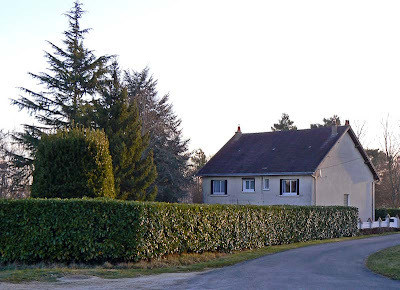 We planned a trip to the store near Loches on Tuesday. We knew there were other garden stores nearby that we could try if the Leclerc didn't have what we wanted. And, Leclerc is also a big grocery store and we needed some stuff. Off we went. It was a very nice drive through the countryside south of us. I haven't had much chance to ride out that way recently, so I enjoyed the views. The vineyards in our valley give way to rolling fields that are turning green with sprouting... er, I'm not sure what. Some colza, some sunflowers, maybe some corn, I don't know yet. And there were plenty of cows, sheep, and chickens in fields and yards along the way. So we got the cold frames home and I assembled them. The instructions are the standard picto-gram variety. The frames are made in Israel and sold in various European countries, so picto-grams work best. You can see on the front page some of the instructions. No tools required! Assembles in ten minutes! No drinking! Recyclable! No drinking? I'm not sure I understand that one. Inside the booklet, it actually says, "Do not attempt to assemble this cold frame if you are tired, have taken drugs or alcohol or if you are prone to dizzy spells." Does blood pressure medication count? I had already enjoyed a few glasses of wine, but I threw caution to the wind and gave it a go. And I will tell you, inserting Tab A into Slot B is a lot more challenging after some wine than you'd think. But I never got dizzy and the frames went together just fine. But it took twenty minutes. Lemon tart. Yum. There are two kinds of lemon tart as far as I know. One is baked, that is the lemon custard is baked in the shell. The other is a lemon custard that's poured into a pre-baked shell. My tarte au citron. Yum. It might also be good with a layer of meringue on top. Although I've done both, the second type is the one I made on Monday. I followed a recipe that I saw someone make on Cuisine TV. I used my standard pâte brisée (pie crust) instead of the sweet crust that the tv guy did. But I used his recipe for the filling. The result was a luscious lemony pie. It has a good deal of butter in it, so it's not for the faint of heart. But it is for us gourmands. Blind-bake your favorite pie crust recipe, or use a prepared crust. Cook it completely, not half-way. 170 g butter, cut into pieces. Whisk the butter in until it melts and is well incorporated. Pour the finished cream into the pre-baked pie shell and let it cool. Make that compost. I was lazy last fall. I raked up a bunch of leaves out front and left them there, in a pile, over the winter. Of course, the pile blew around during the winter months and some of it started to decompose. 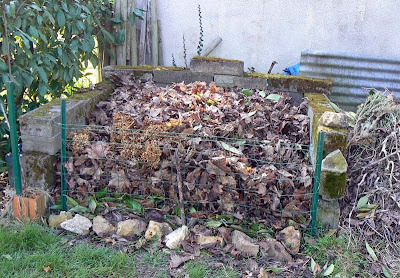 So on Monday I got out there and re-raked and transported all the leaves to the compost pile as I should have done last fall. The left side of the compost bin. The right side needs attention. You can see a thin line of green leaves toward the bottom of the pile. Everything above that line is what went into the pile on Monday. It'll soon sink down and start to rot into compost. When I first started composting in San Francisco, we got ourselves a small urban composting container for the back yard. The instructions were full of all kinds of "recipes" for compost, including lots of advice for making it work better and faster. Although composting is a natural process, it takes more or less time depending on the size and nature of the stuff that goes in. But at the end of the little booklet was the key, the natural secret, that negated all the fancy stuff that came before. It read, simply, "Compost happens." That's been my motto ever since. 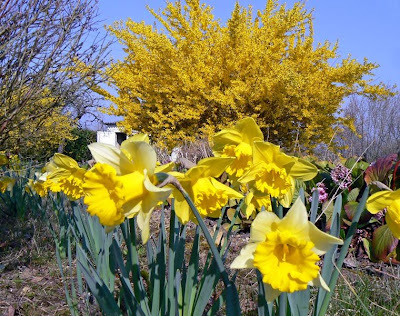 Just another shot of daffodils and forsythia from our yard. The yellow is intense, especially in the sun. 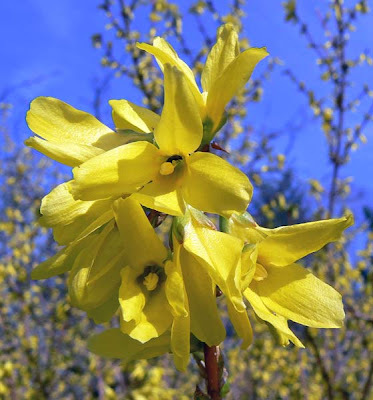 The various flowering trees around the yard and neighborhood are also putting on their show, but somehow my photos of them don't come out very well. So jaune (yellow) is the color for today. I know, bad, bad pun. 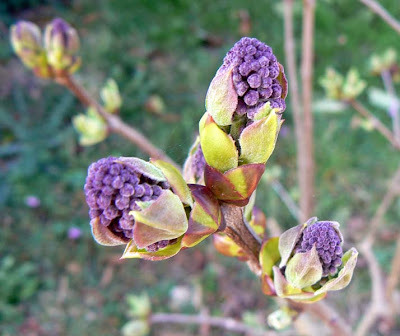 But I'm very excited about the lilac bush. It's covered in buds this year. The lilacs will be gorgeous when they open up. Last year there were absolutely no flowers. I looked up the variety of lilac that we have and read that it blooms every other year. Bummer. We bought and planted it in 2006. It flowered in 2007 but was nothing but leaf in 2008. This year it looks like we're getting a big crop. Wysteria buds against the house getting ready to do their thing. In other budding news, the glycine (wysteria) that we planted the same year is also covered in flower buds. It did flower last year, but this should be an even better year because it grew significantly last year. The first two years it must have been working on its root system; it didn't grow much at all. Then, last year, all of a sudden it went wild. 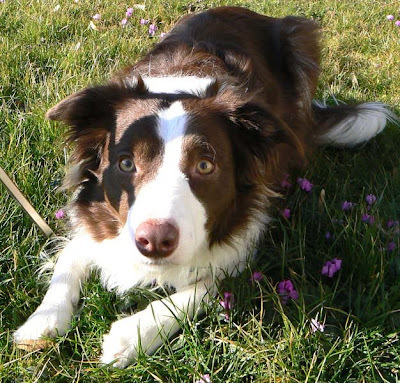 Border collies are very active dogs and they like to have a job to do. They were bred to herd sheep, so they are quite fast, extremely agile, and can be very focused. Since we have no sheep at our house, we've had to find another occupation for Callie. 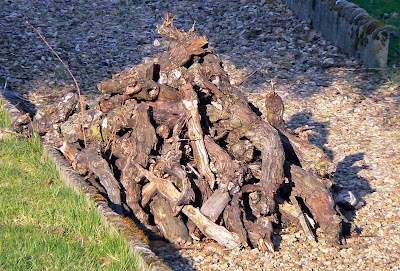 Callie's wood pile, seen from the bedroom window. 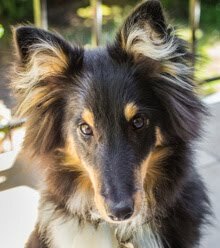 Some border collies are trained to compete in agility courses, running, jumping, negotiating slaloms, tunnels, and hoops. Others are trained to compete in a game called "fly-ball." Neither Ken nor I have the energy or discipline to match Callie's, so these two options were not for us. Callie gets two long walks a day out in the vineyards and woods around our house. 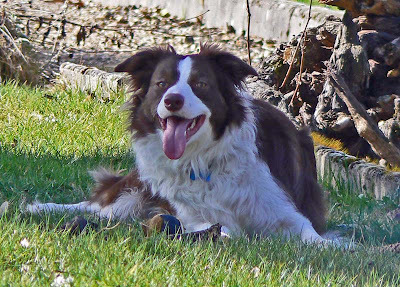 There is ample opportunity to toss sticks for fetching, and we used to do that during our walks. But Callie doesn't really like to fetch. That is, she'll chase a ball or a stick, but she'd rather be chased with it than bring it back for another go. Often she'll just sit down and chew on her prize. One day, however, she decided to bring her stick back home from the vineyard. I think we thought it was funny and praised her for it. Then, on her next walk, she brought another stick home. More praise. This is only part of the wood that Callie's brought home this winter. That's all it took. Now, nearly every walk ends with Callie picking up a stick and bringing it home to the yard. She never picks one up on the way out, only on the way back. And since we walk in vineyards, most of the sticks she finds are dead grape vines that have been dug up and piled at the end of the rows. Some of them are absolutely huge. But that doesn't deter a border collie on a mission. She'll pick up just about any sized trunk and carry it home, weaving in and out of the rows of vines and ducking under wires, keeping a firm grasp on her bounty. This has become her job, and we actually benefit from it. We gather up all the sticks and trunks she brings into the yard and use them in the wood stove or for the barbecue. Grape trunks make great barbecue fires and can add flavor to whatever you cook. They're a prized commodity around here. One year, while an autoroute was being built, some older vineyards were sacrificed. Our neighbor took his trailer out to the site and brought home three loads of trunks for burning. Last year, Ken talked to the grower whose vines are behind our house. He told us that we could take whatever was out there during the winter when the workers did their pruning. They take most of them, but we got a good stash. And for the past year we've been getting nearly two a day, thanks to Callie's hard work. Good dog! This is the back of our house on a recent sunny morning. I'm standing at the point where our road becomes a dirt tractor path that goes out into the vineyards. Our humble house, seen from the back. That cylindrical bush on the left is a laurier sauce (bay laurel). It needs to be trimmed so that the top is flat. I'll get up there and do it one of these days before too long. We keep the leaves in the cellar and use them all the time in cooking. They're the best bay leaves I've ever tasted. The past week has been very nice, with sunny mornings and wonderfully warm afternoon temperatures. We got to be outdoors and actually got some yard work done, mostly just cleanup of fall and winter debris. 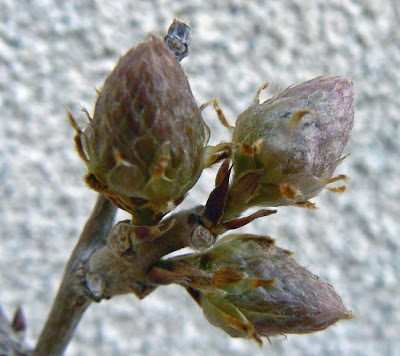 It's also been nice to watch the bulbs come into flower and see the fruit trees bud out. Soon they, too, will be covered in flowers. It's become a bit colder since Saturday, but we're still enjoying the sun. 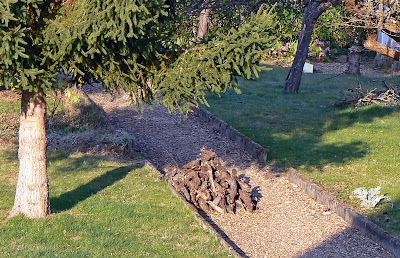 And we're looking forward to even better weather as spring progresses so we can work the soil and get the potager (vegetable garden) started. Tu Veux Que J'te Chante La Mer ? His funeral was held on Friday in Paris. Alain Bashung died last week. He was sixty-one, a heavy smoker, and died, predictably, of lung cancer. I wasn't a huge fan of his. But a few of his biggest hit songs are part of the repertoire of music that defines my first year in Paris, now over twenty-seven years ago. We have a couple of his albums from back then. The television news reports covered his death of course. Friday's memorial service was held a couple blocks from where I lived back in 1981, at the church of Saint-Germain-des-Prés. He was buried in the Père-Lachaise cemetery. I never saw Bashung sing live. I probably should have. He had another relatively big hit in 1991, and another just last year. He acted in more than a dozen films, none of which I can recall seeing. But still, his death jarred me a bit. He was young, and his music conjures fond memories, at least for me. Yet another view of the vineyard. This time, it's the wooden posts that hold up the wires that support the vines. Wooden posts like this are slowly being replaced by metal ones. I took this in the morning sunshine. The vineyards around the house are nearly all pruned and waiting for the first buds to open. The leafing of the vineyard is really great to watch, but we'll need to wait until April/May for the show to begin. 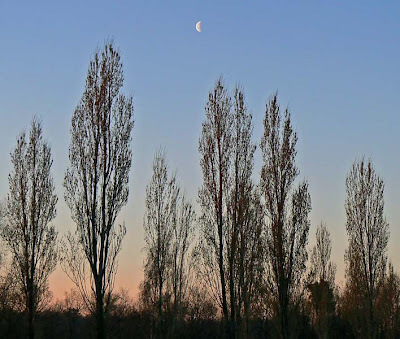 On our vineyard walk this morning, Callie and I watched the moon sink slowly into the southwest. She chases and barks at the moon when it's bright and visible in the morning sky. About 7:15 am on Thursday 19 March. Soon after I snapped this shot, some wispy clouds moved over the moon and the dog lost interest. I couldn't resist posting this one. I was trying to get the flower in focus and not the dog, but it turned out just the opposite. Callie is curious as to why I'm lying on the ground. You'd think that as a professional planner I would be used to things not turning out as intended. 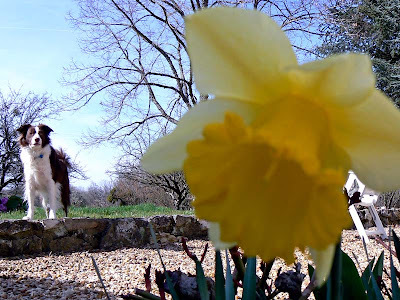 The daffodils are really opening up now. 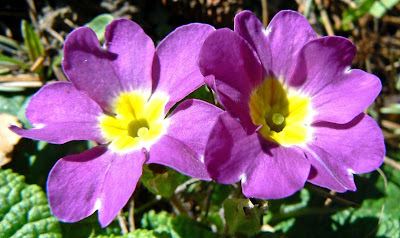 They are terrific little spots of intense yellow in the greenish/brown of the yard. And, the tree buds are fattening up! Now is the time. 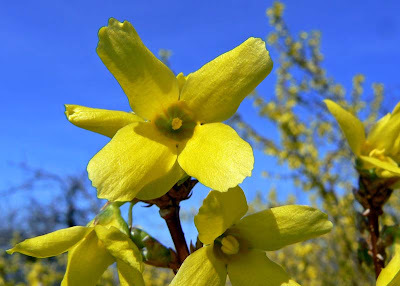 The forsythia bushes in our back yard are blooming. It's very nice. This time of year is very "iffy." It can be nice, it can be crappy. You just never know. And March in France has a reputation for being stormy. They call the squalls les giboulées de mars. I'll be sure to let you know when they occur. In the meantime, we're enjoying some nice weather. Really enjoying it. We can even dry clothes outdoors! Callie is enjoying the spring-like weather we're having. Sunday was the second day this weekend that we've been able to sit outside and enjoy the sun. If you count Friday as part of the weekend. And I do. A happy dog. Can you see the tennis ball in front of her? Our neighbors were down from Blois for the day with one of their daughters and three grandchildren. The kids kept running up and down the road, one with a soccer ball and another on roller blades. Callie just loved that, running the length of the road barking at them, inside the hedge. What fun! Another shot of the happy dog. I can't help but be hopeful that we'll have some good dry spring and summer weather this year. 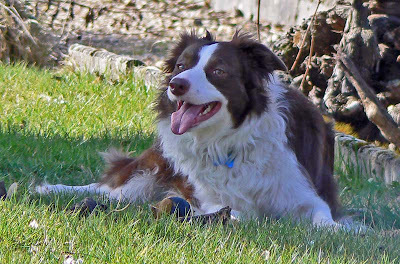 Callie enjoys hanging out in the yard whether we're doing garden work, barbecuing, or just sitting around sipping wine. I'm looking forward to it, too. 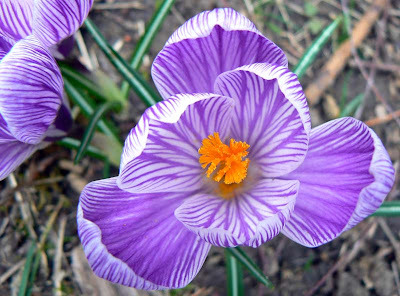 I can't help taking pictures of the flowers that are blooming all over the yard this time of year. So here are some more, and they probably won't be the last. 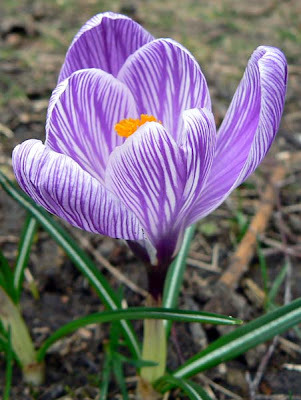 I know, some of you saw them all last spring. The seed planting continues. Ken and I went to a garden store over in Amboise on Thursday and found an inexpensive seedling dome. We also hit a LeClerc store and picked up a few jardinières (window boxes) that were on sale and a couple of tunnels de jardin. I don't know what they're called in English (garden tunnels?). They're little protective covers, like tiny Quonset huts made of fabric, that you put in the garden for seedlings to keep them warm on chilly nights. I got the specialty pepper seeds started in the new dome. Twelve jalpenos, six serranos, and six cayennes. We had really good crops of cayennes in the past, so we're hopeful for more this year. I also moved a lavender plant to a better location. There's still much to do out there. First, and foremost, is picking up all the downed twigs and branches from the yard. Then there's a bit of pruning that didn't get done in the fall. 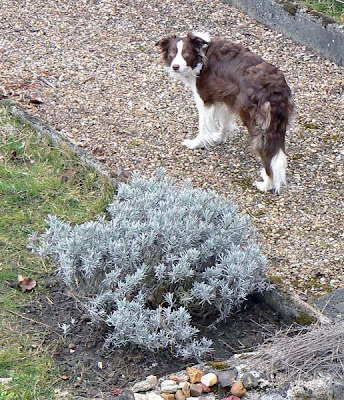 Callie and the lavender in its new location. Next up, there is a dying apple tree in the yard that has to be taken down with the chainsaw. That'll probably be a blog post sometime over the next few weeks. I'm sure you're quivering with anticipation. 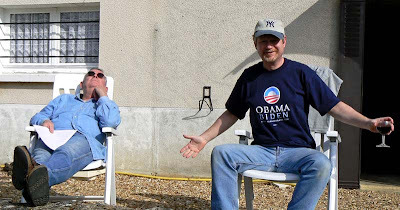 Walt is wearing the Obama shirt that Evelyn sent. Ken is snoozing in the sun. Callie enjoyed it, too. She's not used to hanging out outdoors. But I think that she will get used to it again very quickly. I hope it lasts. 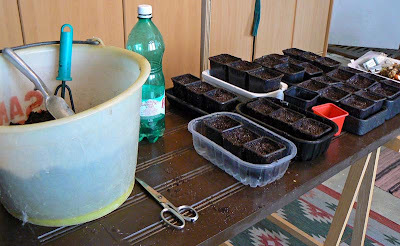 Mid-March is the time to start seeds indoors for the vegetable garden. At least for plants like aubergine (eggplant), tomate (tomato), and poivron (peppers). My bench is an old window shutter on two saw horses. Ken brought a variety of tomato and pepper seeds back from the states for us to try. I picked up some eggplant seeds at the garden center the other day, along with a bag of fine soil for seedlings. I set up an impromptu potter's bench in the utility room so I could work in relative comfort; no bending. In our first years here, we bought tomato, eggplant, and pepper seedlings at the local markets and put them directly into the garden. We saved all the little pots they came in so that we could eventually try to grow directly from seed. Ken washed all the little pots in a bleach solution to kill off any molds or fungus, and I filled each with soil. Next, in went the seeds. Two varieties of eggplant, and ten varieties of tomato. We're hoping to have at least eight eggplants and two of each tomato variety. Ten bell pepper seeds are waiting to sprout inside my little hothouse. 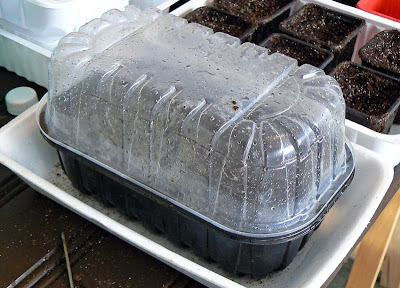 The backs of the seed packets say that peppers need very warm temperatures to germinate and grow, so I had to rig up a plastic dome before I get them planted. I used the clear tray in the first photo above to make one. I may have to buy a commercial seed dome at the garden center so I can plant more. I wrote previously about the re-usable plastic bottle closures that we're starting to use more and more at home. A couple of you asked to see them, and your wish is my command! We started out five years ago buying corks from the local winery supply store, and while they're not all that expensive, the cost does add up over time. 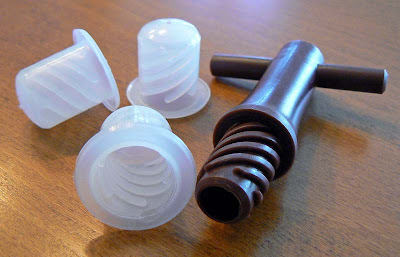 Plastic bottle closures and the "corkscrew." None of our wine is intended for long-term storage. Most Touraine wines are made to be drunk young, within two or three years. They never last that long at our house. Because we don't have a proper wine cellar, storing wine for more than a few months, especially in the summer, is impractical and a waste of good wine. And it seems a waste of a natural resource (cork) to store wine for just a few days or weeks. I do save used corks to stoke fires in the wood stove since they burn very hot, but still. About a year ago, a friend of ours gave us a little kit with plastic re-usable "corks" and a special screw; they're available in most of the stores around here. After we tried them out, we realized that we really no longer need to spend money on real corks. Using the plastic closures is simple: we put them into a small bucket of hot water just prior to corking the bottles. This makes them supple so that they squeeze into the bottle easily. That's it. The same tool for inserting the cork is the one used to remove it. You can see the corks on some of the bottles in my previous post. On Monday I bottled a second case of wine. This time it was some Valençay rosé. I thought that while I was at it I'd share a few photos taken inside our "cellar." Our bottle rack holds both filled and emptied bottles. 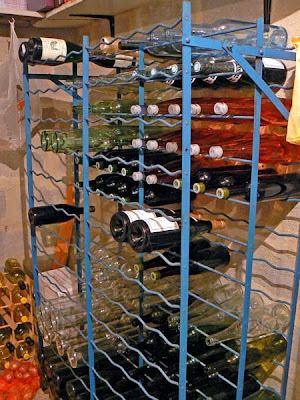 Ours cannot really be called une cave (a wine cellar), even though we keep wine there. A proper wine cellar in a house like ours would be dug below ground level with access likely by trap door and a steep stair or ladder. In fact, one of the houses we considered back in 2002 had exactly that kind of cellar. The trap door was on a closet floor, and the cellar was below grade making the temperature and humidity in there perfect for storing wine. 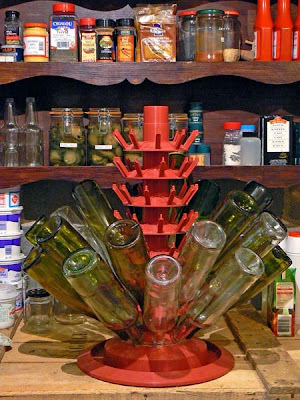 The bottle drying rack and pantry shelves behind. In the house we bought, however, there is only what can be called a pantry off the utility room on the ground floor. It's located on the northwest corner of the house and has a simple sand floor. But it isn't insulated and the temperature changes with the outdoor temperature. Not ideal for long-term wine storage. 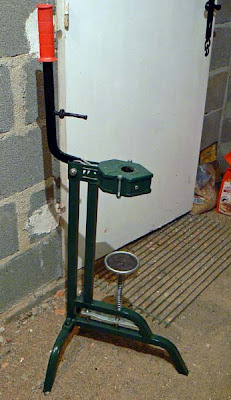 The corking machine, which is getting less use these days. 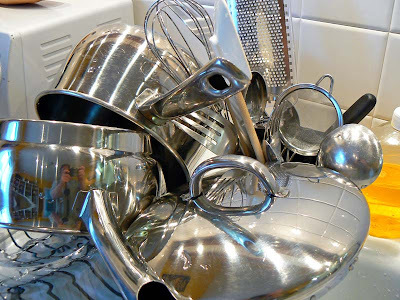 But it does function as a great pantry, and we use it to keep all manner of dry and canned goods, oils and vinegars, dog food, empty jars and other containers, and our bottling supplies. And yes, we do keep our wine in there, but it's not being stored for any significant length of time, so it's not a problem. Ken and I have talked about this before on our blogs, but since it's a pretty routine thing around here, I thought I'd mention it again. We live in a wine producing region and we buy the vast majority of our wine locally. Most of our local producers (who are also our neighbors) sell wine en vrac (in bulk) in addition to the bottled product. Bottling a case of Valençay vin de pays. Needless to say, the bulk wine is more economical because we don't have to pay for bottles, corks, labels, or the labor to put it all together. And mostly it's the same wine that's in the bottles. The exceptions, of course, are any special vintages or blends and certain "signature" wines that are only sold in bottles. 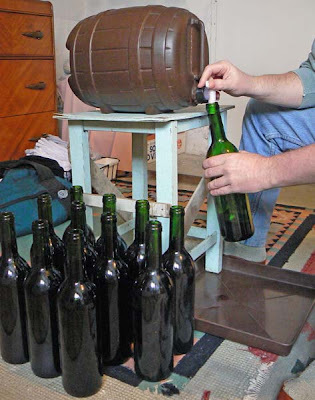 We have four ten-liter jugs that the winemakers fill up directly from the barrel or tank. They use a hose that looks similar to a gas pump nozzle to fill each jug. Then we take the wine home and fill up our own bottles (that are cleaned and re-used every time, of course) and we cork 'em up and put 'em away. Each ten-liter jug holds just over a standard case of wine; thirteen bottles and a little more. We've saved bottles from wine we bought during our first year here and use them over and over again. They get rinsed with hot water once they're empty, then they dry on a special bottle rack in the cellar until it's time to fill them again. For a while we were buying corks at our local wine producers' supply cooperative. Corks for short-duration storage are not expensive when bought by the thousand, and we have a hand-operated corking machine that they sold us for twenty-five euros about five years ago. That all works pretty well, considering that we buy wine for current consumption and not to put away to age for many years. Recently, however, a friend gave us a little package of re-usable plastic closures and a special corkscrew for them. It turns out that they work very well for our short-term storage needs and will nearly eliminate our need to buy corks. 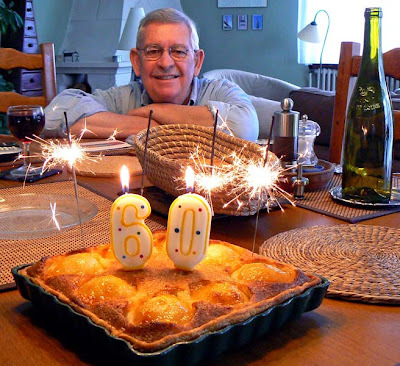 One of my readers asked for a recipe for the tarte amandine that I made for Ken's birthday. I'm only too happy to oblige. Ken found the recipe on a French recipe site, I think. 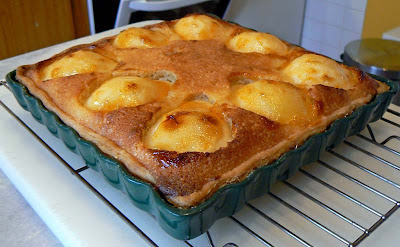 The first time I made this (link) I sliced the fruit, pears in that case, and arranged them on top of the filling. apricot (or other fruit) glaze (press a few tablespoons of apricot jam through a sieve and heat in the microwave until it thickens a bit. If it's too thick, add a dash of the fruit liqueur or water). Continue baking until done. Let cool. Serve. 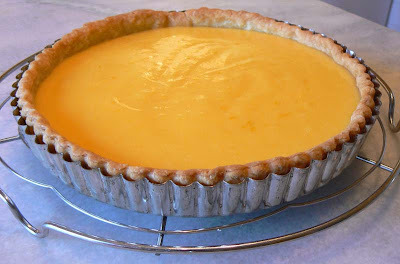 The glazed and finished tart. 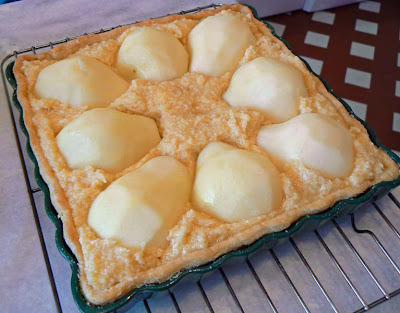 For a pear tart, you can use pear liqueur (poire williams). For any fruit, you can use always use kirsch (cherry liqueur). If your fresh fruit isn't quite ripe, you could poach the halves in a bit of syrup prior to making the tart. 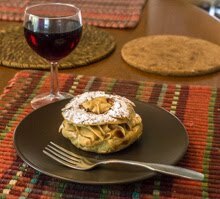 You can also use a sweet crust (pâte sablée) instead of a standard pie crust. 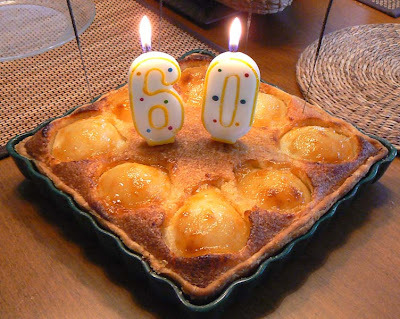 The "birthday cake" is an amandine aux poires, made in a new square tart pan that Ken's mom sent. It's cool, and worked great for this pie! The pie, minus the sparklers. He's suffering from jet lag and a chest cold, but he's doing alright. I got the special candles and the sparklers from the supermarket. But the darned sparklers took so long to light that by the time I got the last one lit, then got the camera, the first one was done. Oh well, that's how it goes sometimes. 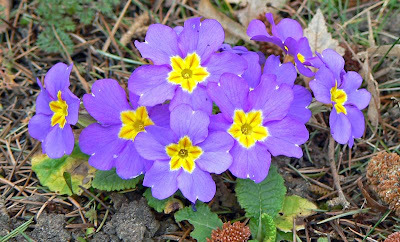 The primevères (primroses) are starting to do their springtime thing. So I thought I'd show you some more. I'm heading out today to collect Ken from the train station near Tours. If all goes well, he'll get in this afternoon and we'll head over to Vouvray to buy some wine for his birthday, which is tomorrow. We have a special lunch planned. I'll take bets on which one of us blogs it. On second thought, perhaps not. One day a couple of weeks ago I noticed on my blogger dashboard that I was getting perilously close to the one thousand mark. And today I will have put pictures and words on this site one thousand times since I started in 2005. I said to myself, self, you should do something special for that. So I prepared this very brief video to thank all of you who visit wcs: another american in france. Now you see why I never had a career in television. Walt (the "w" in wcs). We had the best Saturday of the year, so far. The sun was warm, there was no wind. It was t-shirt weather and it was spectacular. 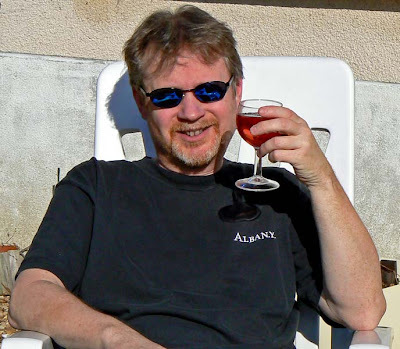 Enjoying a glass of rosé in the afternoon sun. So I spent a little time outside, in the sun, sipping wine. Callie enjoyed being outside, too. I know there's cold, wet weather coming our way, but if Saturday was a sign of things to come, I'm all for it! Callie had a nice time outdoors, too.